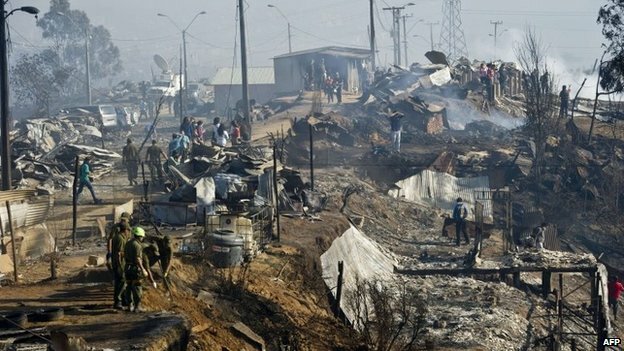 More than 10,000 people have been evacuated from Chile’s port city of Valparaiso to escape a moving fire that has killed at least 12 residents, injured some 500 more and destroyed at least 2,000 homes. Some 1,200 firefighters are battling the large blaze. President Michelle Bachelet put the army in charge of the evacuation after declaring the city, 70 miles west of Santiago, a disaster zone. Security forces are on the streets to maintain order and prevent looting. One official said it was the “worst catastrophe” he had ever seen. “We fear that the fire will spread to the center of the city, which would increase the severity of the emergency,” regional governor Ricardo Bravo, a life-long resident of Valparaiso, said. The old center is a Unesco World Heritage Site, packed with old buildings that are vulnerable to fire. Strong Pacific coast winds have pushed the fire deeper into the neighborhoods of Valparaiso, hampering the battle to contain the blaze. The city is built on a series of steep hills, separated by narrow winding streets, making the job of firefighters all the more difficult, says the BBC’s Gideon Long in Santiago. Large parts of Valparaiso are without electricity, and residents were said to be suffering from smoke inhalation. President Bachelet is in the city to oversee an emergency committee’s response. “The people of Valparaiso have courage, have strength and they aren’t alone,” she said during a tour of the worst-hit areas. “In some places the fires have started again so we’re working on this and people will continue to be protected,” the president added. “The fire raced down the hills and destroyed everything in its path,” Miguel Ramirez told the AFP news agency. This is the second emergency that President Bachelet has had to face in the first month of her second term in office, after an 8.2 earthquake hit northern Chile on 1 April. Fires are frequent in central Chile, where summer sends temperatures soaring. MANAGUA | Thousands of Nicaraguans woke up in the streets Monday after a sleepless night rocked by two strong earthquakes, part of a string of tremors that have kept the Central American country on edge since late last week. A magnitude-6.1 quake Thursday evening has been followed by hundreds of small aftershocks and at least seven quakes powerful enough to send people running in panic from homes and businesses, including a magnitude-6.6 tremor Friday. The Sandinista government has placed the country on red alert, the highest possible level, and is urging Nicaraguans to sleep outside their homes until further notice. Life in Nicaragua, whose capital was devastated in 1972 by a magnitude-6.2 quake that killed nearly 10,000 people, has become a tense game of waiting between shakes. In Santa Ana, a poor neighborhood a few blocks from the major fault line that crosses Managua and caused the 1972 quake, dozens of people took refuge in a bar and on the street outside after their shacks were damaged by the latest tremors. On Sunday night, the country was hit by magnitude-4.6 and magnitude-5.6 quakes. On Monday morning, members of the 23 families sheltering at the bar moved chairs off the tables to make room for more people. First lady Rosario Murillo, who is the government’s spokeswoman, said the recent seismic activity had reactivated the Managua fault, frightening city residents with memories of the 1972 quake. The U.S. Geological Survey said it could not confirm that, but said it was common for large quakes to affect nearby faults, sometimes making them more liable to cause new quakes and sometimes less so. A few hundred meters (yards) away, Daniela Artola, 56, checked the severely cracked walls of a motorcycle dealership that abuts her home. The building was one of the few in the neighborhood that survived the 1972 quake. 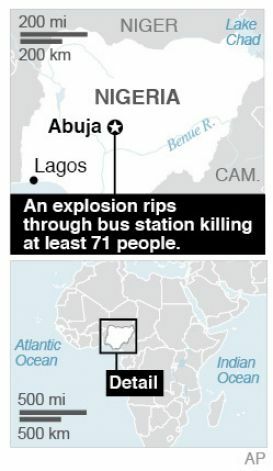 A morning rush hour bomb killed at least 71 people at a Nigerian bus station on the outskirts of the capital on Monday, raising concerns about the spread of an Islamist insurgency after the deadliest ever attack on Abuja. 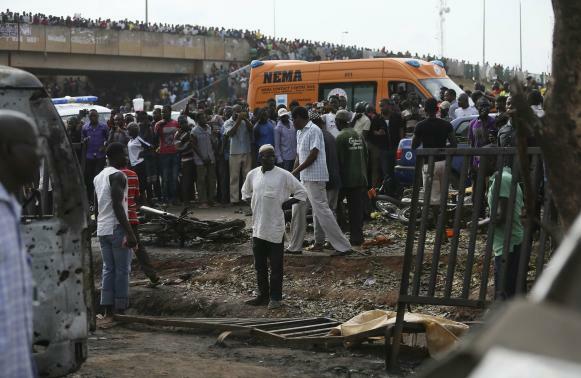 The blast left a hole 4 feet deep in the ground of Nyanya Motor Park about 10 miles from the city center. It happened at 6:45 a.m. as people were traveling to work. President Goodluck Jonathan pointed the finger of suspicion at Boko Haram, although there was no immediate claim of responsibility from the Islamist militants who are active mainly in the northeast. As well as the dead, police said 124 were wounded in the first attack on the federal capital in two years. … Boko Haram is loosely modeled on the Taliban movement in Afghanistan, and has forged ties with al Qaeda-linked militants in the Sahara. Security experts suspect the explosion was inside a vehicle, said Air Commodore Charles Otegbade, director of search and rescue operations. The bus station, 5 miles southwest of central Abuja, serves Nyanya, a poor, ethnically and religiously mixed satellite town where many residents work in the city. The attack underscored the vulnerability of Nigeria’s federal capital, built in the 1980s in the geographic center of the country to replace coastal Lagos as the seat of government for what is now Africa’s biggest economy and top oil producer. Sixteen buses were torched in Monday’s blast and another 24 damaged, police spokesman Frank Mba said. b) How many firefighters are battling the blaze? Why is the fire so difficult for them to contain? b)What is the government response to the series of earthquakes? b) The Islamist group Boko Haram is engaging in ongoing attacks to murder as many civilians as possible because they want to impose Sharia (Muslim) law on the country. The government so far has not been successful in eradicating this group. What do you think the Nigerian government should do to stop this murderous group of Islamist terrorists? Sunday’s was the worst fire to hit the picturesque seaside city of 250,000 people since 1953, when 50 people were killed and every structure was destroyed on several of the city’s hills. 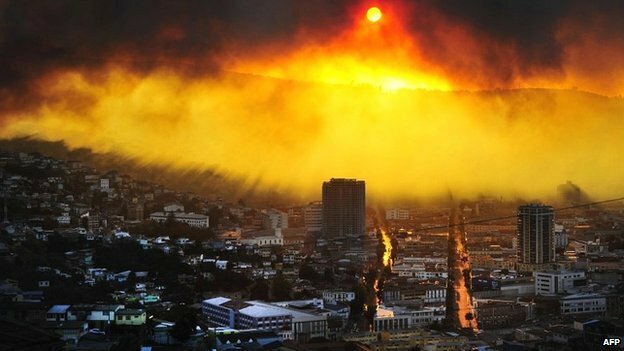 While the fires were contained to the hills, President Bachelet declared the entire city a catastrophe zone, putting Chile’s military in charge of maintaining order. Valparaiso, which was declared a World Heritage Site by UNESCO in 2003, is known for colorful neighborhoods hugging hills so steep that people have to use staircases rather than streets. 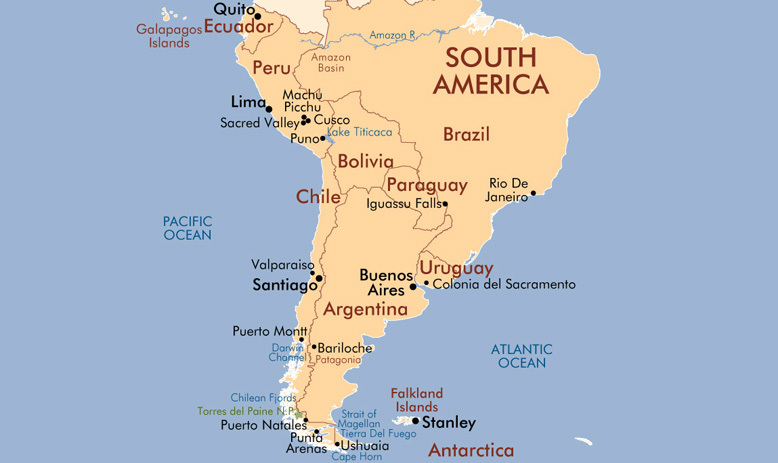 It is about 75 miles northwest of the capital, Santiago, has a vibrant port and is home to Chile’s national legislature. In a separate assault, insurgents killed eight people at a teacher training college in the remote village of Dikwa on Wednesday, witnesses said. “They entered at night. They killed my brother Madu. The insurgents shot him in front of his wife and two sons. Then they shot them, too,” Yakubu Saleh said, choking back tears over the telephone.